DONNE IMPEDITE DI TUTTO IL MONDO UNITEVI! SE VI SIETE MAI CHIESTE COME MAI LA D’ANGELO HA UN’ACCONCIATURA PAZZESCA AD OGNI SPETTACOLO, PUR ANDANDO SEMPRE PER UNO ORA FINALMENTE SAPRETE PERCHE’! 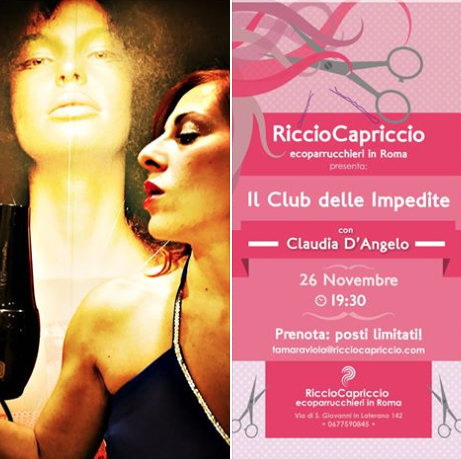 E DICO DI PIU’: POTRETE CARPIRE I SUOI SEGRETI PARTECIPANDO A “IL CLUB DELLE IMPEDITE” LA NUOVA STRAORDINARIA AVVENTURA DI CLAUDIA D’ANGELO FIRMATA “RICCIOCAPRICCIO”. CI SARA’ DA DIVERTIRSI…..